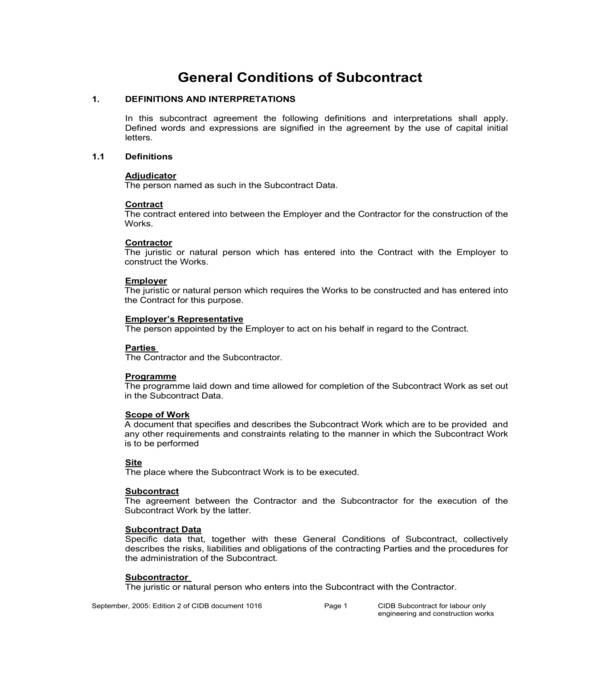 A construction subcontractor agreement form is a document which is used by subcontractors who will be taking part in a construction project to record their affirmation and understanding of their roles and responsibilities. In addition, the form is also essential for identifying what the subcontractor must provide either manpower or machinery which will be used in the project. 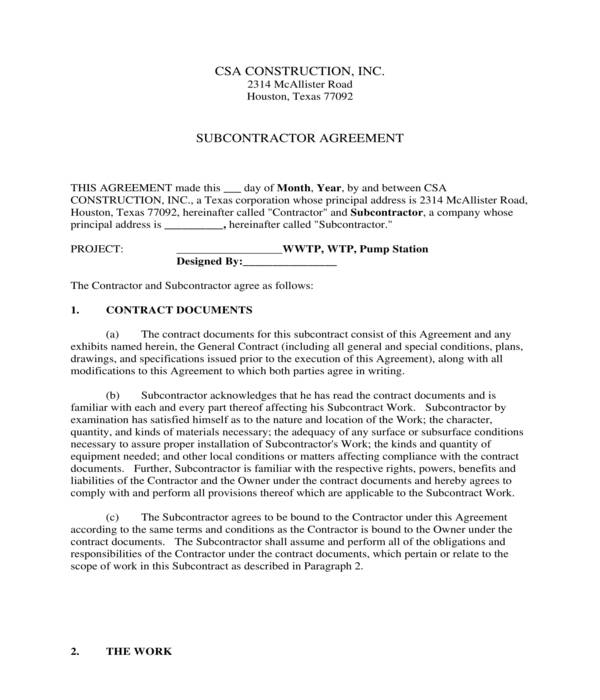 Moreover, construction subcontractor agreement forms must be reviewed prior to signing in order to have an assurance that the term, provisions, and restrictions defined in the agreement are accurate to the negotiations and needs of the involved parties. 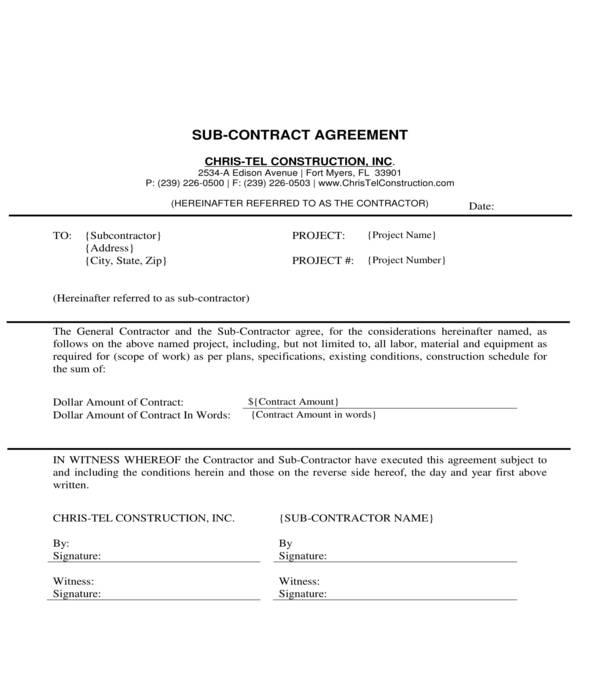 What’s In a Construction Subcontractor Agreement Form? 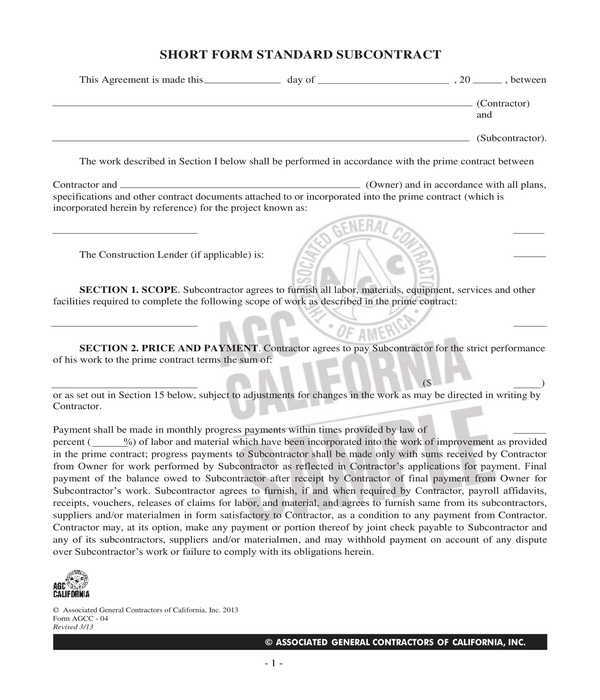 Construction contract background: This section of the form is for laying out the contracts and agreement forms which had been created prior to the subcontractor agreement to be signed by the subcontractor and the project owner. A statement regarding the subcontractor’s acknowledgment to the other contracts should also be included in the form as well as the subcontractor’s agreement to be bound to the terms, conditions, and provisions of the signed contracts. Contract sum and payments: This is where the amount to be paid by the contractor to the subcontractor will be stated in lieu of the execution of the work and the contract. In addition, the actions to be done by the subcontractor upon receiving the payments such as providing an invoice to the contractor, as well as in accepting the risks of non-payment from the project owner should also be specified in this sections of the form to inform the subcontractor of his responsibilities. Indemnification, insurance, and bonds: Most contracts and construction agreements have indemnification clauses. The purpose of the indemnification clause is to document the affirmation of the subcontractor in holding the owner and contractor harmless from any claims and demands in the duration of the project. Along with the indemnification clause would be the insurance and bonds clauses which are solely for recording that the subcontractor has his own insurance coverage prior to working the project. The bonds clause, on the other hand, is for indicating the requirement of the contractor regarding performance and payment bonds. Change orders: It is essential that the agreement form will include a construction change orders clause which is for indicating that alterations and deletions of the materials ordered for the construction project will not be permitted unless the contractor himself submits a written and authorized change order. This clause will also state the obligation of the subcontractor to adhere to the changes that the contractor mandates regardless if there are disputes and issues which will arise. Damage to other work: There can be several subcontractors in a single construction project. This is the reason why a clause which indicates the subcontractors’ responsibilities to be cautious in their own works and the others’ works should be included in the form. This clause must then be accompanied by a cleanup and safety clause which specifies the roles of the subcontractors to maintain cleanliness and the safety of their workers at all times. 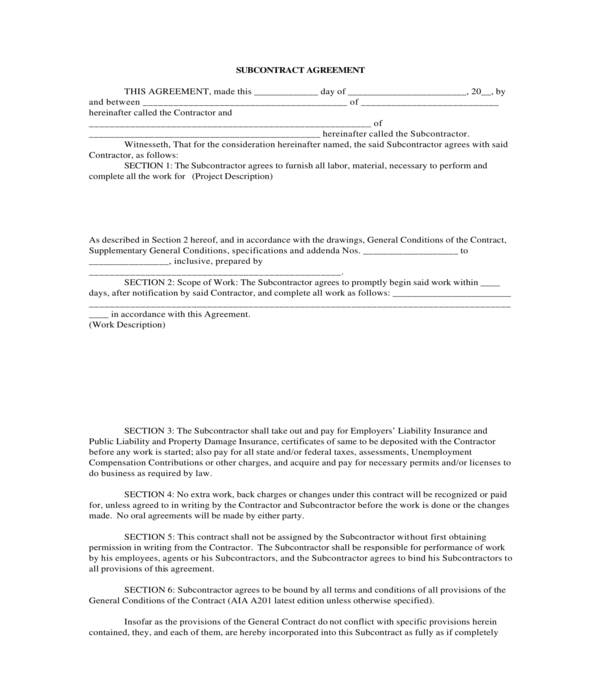 Lastly, clauses for specifying assignments, charges, terminations, governing laws, and attorney fees should also be stated in the agreement form along with a signature block for the signatures of the involved parties of the construction project. 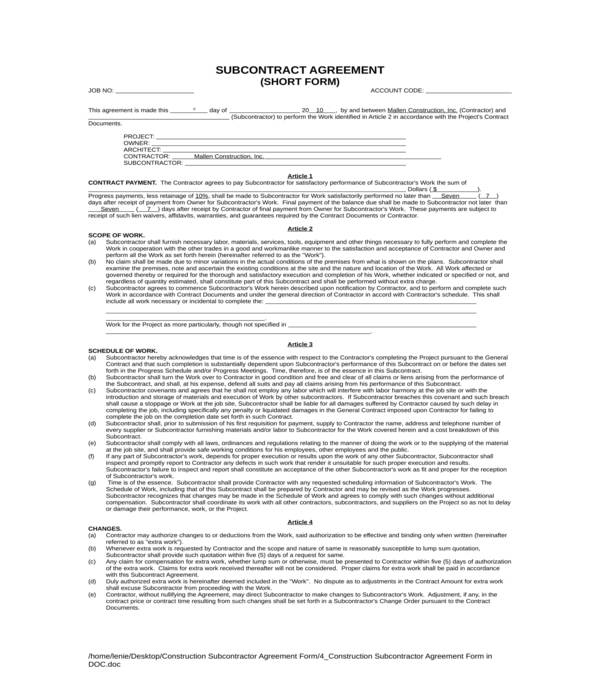 Templates make it easier to have a construction subcontractor agreement form especially if there is an immediate need for the agreement to be created in order to proceed in the construction project. In our site, the templates can be downloaded by simply clicking on the download button, can be used by extracting the zip file, and can be updated by simply changing the contents and filling out the entry fields of the form. Construction subcontractor agreement short forms are summarized versions of long forms. One benefit of a short form is that it presents the clauses, articles, and particulars of the form in a brief yet accurate manner which allows the involved parties to be able to understand with less difficulty. In addition to making the form short or summarizing and simplifying the contents of the agreement, each word or term which will be used should be defined in order to bridge communication gaps and conflicts. Step 1: Choose the template. The template varieties in our site differ on their sizes and formats as well as varying designs and formats. Step 2: Download and extract the file. The form templates which are on our website are compressed in zip files. One known advantage of file compression is that it minimizes the number of bytes or the size of the file which means that zip files are lighter as compared to raw and unzipped files. Furthermore, to use the zip file, an extraction must first be executed which can be done easily by clicking on the “extract” option of a device to extract and move the file to another location. Step 3: Customize or edit the contents. Most templates have blanks and lines for the data and information which will be inputted into the agreement, however, there are some templates which contain placeholders and words which should be changed based on the needs of the parties involved in the agreement. After downloading and customizing, the form must be saved with a file name which can easily be identified and searched in the device where it is saved. It also helps if the form will be available in varying formats such as in “.DOC”, “.PDF”, and in “.XLS” formats.